Compelling thriller and historical-fiction novel, “Message in a Shell,” follows Sami Badroni, a friend and smuggling partner for a high-ranking Palestine Liberation Organization official in Beirut, during the civil war in Lebanon. The story, inspired by real-life events and occurring in the 1970’s and 80’s, finds Sami entangled in events forcing him to flee his homeland, clear his name, and question those close to him. The author of “Message in a Shell,” Ghazi Kaddouh, wrote this novel to fictionalize true events that occurred during the height of the civil war in Lebanon. His goal in telling this story is to inspire readers and give them hope, and to shine a light on the realities of war, religion, terrorism and culture in Lebanon and the middle-east in the 1970’s and 80’s, and today. “I want my readers to believe that there is always a way out, even when it seems all the doors have been shut,” the author said. “This book is a must read. Your heart will race as you experience Sami’s journey. I absolutely loved this book and it truly inspires me,” a reviewer wrote about the book. 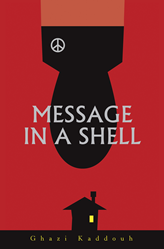 “Message in a Shell” will remind readers that any event can serve as a catalyst for transformation. Ghazi Kaddouh is a UC Berkeley graduate and former Harvard University staff psychologist. He immigrated to the United States in 1983 at the height of the civil war in Lebanon, where he witnessed many of the real-life events that inspired this novel. Dr. Kaddouh currently works and lives in Hong Kong with his wife and two children. For more information, please visit https://www.gkaddouh.com/.